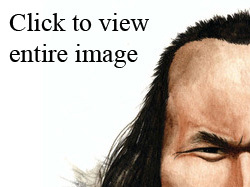 Preserved by the permafrost in Greenland, a clump of hair belonging to a man who lived four millennia ago revealed his genetic tendency for male pattern balding. Archeologist discovered the hair 24 years ago among artifacts of the Saqqaq culture, the earliest known inhabitants of Greenland. Recently, eighty percent of h is DNA was sequenced, revealing his hair dark color, brown eyes, A+ blood type, and tendency toward androgenetic alopecia (male pattern balding). A report on this ancient human appeared in the February 2010 issue of Nature. The man has been named “Inuk,” and his is the first whole genome of an ancient human to be analyzed. So far, only eight whole genomes of living people have been decoded. Androgenetic alopecia is a common problem whose genetics is not fully understood. Male pattern balding involves gradual thinning and hair loss on the top and front of the scalp. In its advanced stages, a “wreath” of hair remains around the sides of the head. This pattern of balding affects mostly men, and it is related to their sensitivity to the hormone dihydrotestosterone (DHT). 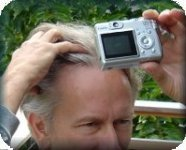 Dihydrotestosterone levels increase with age; therefore, male pattern balding is more prevalent as people age. Male pattern balding tends to run in families. A 2008 study in the Journal of Investigative Dermatology found that a specific gene sequence associated with androgenetic alopecia. Inuk was found to have this sequence, which is why an artist’s impression of Inuk’s appearance shows a receding hairline. So it seems that the receding hairline is inevitable – or is it? While we may share genes similar to Inuk’s, our lifestyles are very different. Modern advances in nutrition, medication and surgery give us more choices in our appearance and our response to male pattern balding. Nutrition. Certain nutrients, such as whole whey protein and biotin, have been discovered to help reduce many types of hair loss. These nutrients are available from special nutrient-dense diets or through hair supplements. Medication. The Food and Drug Administration has approved finasteride (known by the brand name Propecia) as an oral daily pill that stops the hair loss process in approximately 86% of the men who take it regularly. If that medication does not work, topical Rogaine can be used to slow hair loss and promote the growth of new hair. The main problem is that these medications must be continued to have a permanent effect. When the medications stop, so do their effects, and balding continues. Additionally, there are can be annoying or serious side-effects, such as allergic reactions and sexual functioning problems. Also, the cost of these drugs can be very high over time. Surgery. Hair transplant surgery is the only permanent solution to male pattern balding. Modern hair transplants use very small follicular units to achieve a natural look. This is done on an out-patient basis and does not require bandages or a long recovery. A strip hair is removed from the patient’s scalp and the follicular units are separated. Suitable follicular units are transplanted into tiny slits in the balding or thinning areas of the scalp. New hair grows in 3-6 months. Done by a skilled hair transplant surgeon who specialized in hair transplants, this procedure is difficult or impossible to distinguish from the patient’s original, natural hairline. Unlike Inuk, we are fortunate to have a safe, effective and permanent means to overcome any tendency toward androgenetic alopecia using modern surgical methods. This entry was posted in Baldness, Genetics, Hair Health, Hair Loss, Hair Loss Products, Hair Transplant, Hair Transplants on February 19, 2010 by Larry Shapiro.